Nier Automata. My interest was piqued when Nier was released back on March 7th. Mike Fahey reviewed it, saying, “It’s a game that’s whatever it needs to be at any particular moment to be completely amazing.” He then went on to praise its combat system and accessibility. As the weeks went on, word of its interesting death mechanic came to light in which you (in Dark Souls fashion) must recover your corpse or lose a type of buildout. The more interesting aspect is summoning another players AI to help you (kind of like a reverse of Let It Die). All of this sounded amazing, but do you remember what was happening back in March?! Nier had the unfortunate timing of coming just a week after Horizon, the Switch, and Breath of the Wild. Naturally since I couldn’t get a Switch, I dove into Horizon, aware of Nier, but too eager to pass up Guerilla Games first foray into anything not titled Killzone. 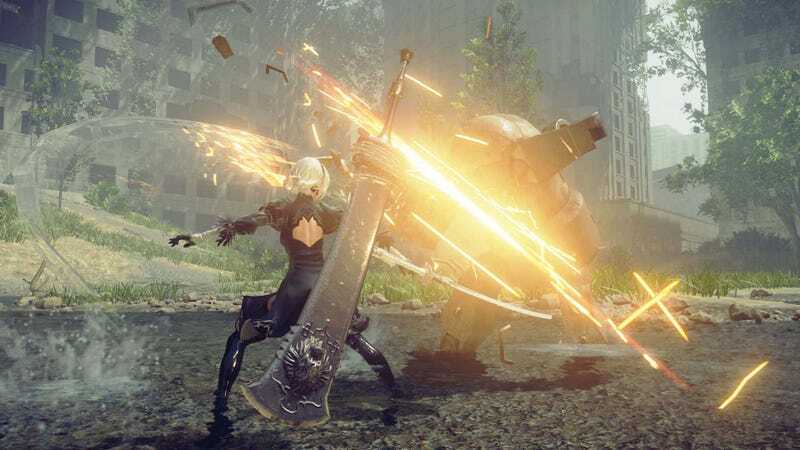 Nier has been in my periphery ever since, but it really got planted in my mind when Patrick Klepek threw this on twitter. I was aware of his playthrough from his chatter of Nier on the Waypoint podcast, but to hear of how the story and experience impacted him really resonated with me. Fast forward to this past weekend (Thanksgiving weekend) and I’ve finally started Nier. I picked it up for the comfortable price of $25 on Black Friday and couldn’t pass it up. Nier opens on a squadron of jets in flying towards a base. It’s presented as a top down shooter. You take out the few enemies on screen and all of sudden your jet turns into a mech, and twin stick shooting commences. I like the shift in playstyle. Then it shifts again to a corridor run, camera positioned behind your jet, as you barely miss barriers, hurtling past them. Suddenly, you propel from your ship, sword in hand, engaging in a blistering sword fight, reminiscent of the finest anime. The perspectival shifts come suddenly and swiftly, demanding attention and quick thinking to adjust your hands accordingly. I am reminded of the versatility of the videogame medium, and left questioning how they still lag behind television and film in the entertainment circuit. Fast forward an hour or 2, and I find myself in an open world, making areas connect via shortcuts, learning about the robots that have driven humanity from Earth and the millenia long struggle for survival between the humans and their seeming conquerors. I have been told that Nier explores the heights and depths of humanity, in ways that only videogames are capable. So far I have encountered robots mimicing human behavior, giving birth to their own “child,” and a village that has chosen against their programming, choosing civilization (from commerce to philosophy) as they seek to live peacefully alongside humanity. I am intrigued and hold high expectations for the questions Nier will answer and raise.